Eat. Live. Laugh. and sometimes shop! 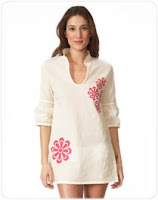 : Tunic Love, indeed! As I have shared before, I love a good tunic. I may have a tunic obsession, though neither my husband nor any good friends have yet scheduled a tunic intervention. This may, however, be the breaking point. I found a tunic company with a conscious! 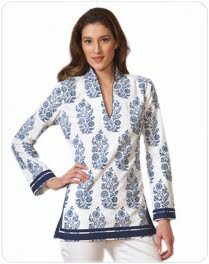 I am simply giddy with excitement: I can now quench my near insatiable tunic desires whilst providing clothing for children in developing countries and supporting communities and artisans. There is indeed good in the world! 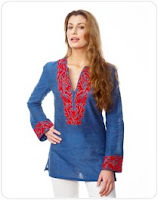 The company is TunicLove and their tunics are as varied as they are fabulous! We use the finest quality fabrics and materials and our garments are crafted to be the best. We are happy to be a source of support to local communities, weavers, and seamstresses who devote their entire lives to their craft, and who we are fortunate to work with. When you wear TunicLove, your contribution goes directly towards preserving these age old skills. Support children in need-- With our ‘You Buy 1-We Gift 1” each purchased by you is matched by a gift of a basic set of clothing from us to a child in need in the developing world. Each of our garments is handcrafted with love and care which is all passed on to you! Well, it is official: I love TunicLove! Here are a few of my favorites! If all this wasn't enough, they also will custom size a tunic for you! You pay an additional $15 and provide your measurements. How easy and wonderful is that if you are exceptional tall or petite!